Never leave dogs in the car. Never leave a dog unattended in a parked car on a hot day -- even if the windows are down. "There is never a safe way to leave your animal in a car in the summer," Brainard said in a university news release. "Even with the windows down, it still gets much hotter inside a vehicle than outside." Always provide water and shelter. Dogs can get heat stroke just like people. Never leave a dog outside without access to fresh water or shelter. During very hot or humid weather, dogs should be brought indoors if possible. "Dogs don't sweat. The only way for them to get rid of heat is evaporation through their tongue," Brainard said. "The more humidity, the less effective that evaporation will be." Avoid strenuous activity during peak sunlight hours. Dogs may not be able to run as far or as fast in hot, humid weather -- even if they run consistently during the winter. "There are some dogs that will continue to push themselves no matter what they feel. If you throw a ball, they'll continue to fetch it," Brainard said. He noted that pet owners may have to set activity limits during the hottest part of the day to keep their dogs safe. Some dogs need more help than others. 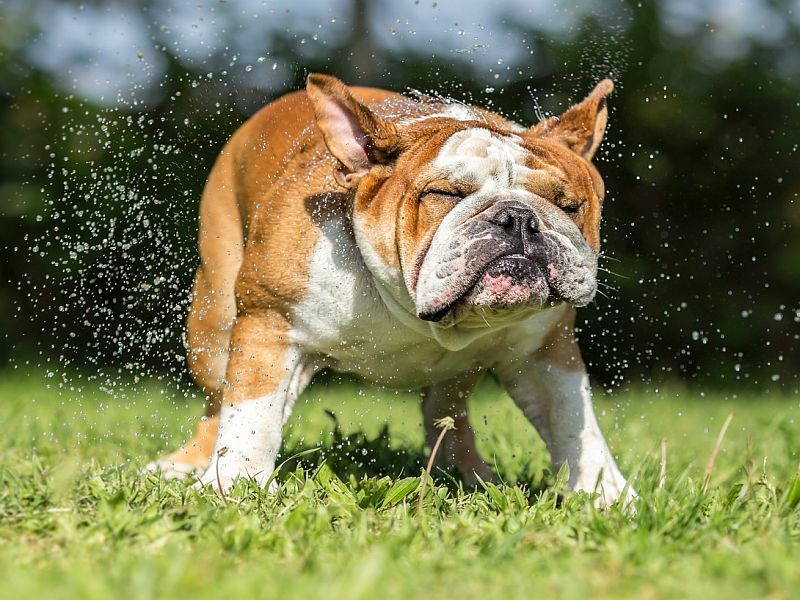 Hot weather can be more taxing for certain dog breeds, including pugs, bulldogs and other "flat-faced" dogs. Older and obese dogs may also be less tolerant of the heat and need to take breaks and drink water more often. Not all dogs can swim. "If you take your dog out on a boat or to the lake, be sure you know they can swim ahead of time," Brainard said. Dogs heading out into deep water should wear a doggy lifejacket. Protect dogs against summer pests. Pets should be protected from fleas and ticks with the appropriate preventive treatments. Pet owners should keep in mind that the treatments made for dogs are harmful to cats until they are dry. It's also important to be aware of snakes, which may be more active in the summer. Don't forget the sunscreen. Certain dog breeds have sensitive skin that can be irritated by the sun's UV rays. These pets may benefit from sunscreen that is safe for animals. Sunscreens formulated for people, including products that contain zinc, may be toxic to dogs. Consult a veterinarian. Pet owners who have concerns about their dog's sun and heat exposure, ticks or fleas should talk to their animal's vet. The ASPCA website also has a 24-hour poison control hotline and emergency medical guidelines.